Former Idols 2003 and Popstars 2009 finalist Dewi Pechler, who recently made a return to the Dutch top 10 with ‘Sour‘, singing an acoustic studio version of ‘Just The Way You Are’ by Bruno Mars. So this is the confusing new Nelson Moraïs single! Not confusing in its quality, as it’s quite clearly on the amazing side of things, but as to exactly what project this new release belongs. I introduced you earlier to Nelson, brother of Elsie Moraïs and Eurosong 2008 participant. Now last Friday he was on Peter Live, singing a medley of ‘Love Me‘, ‘She’s Gone‘ and ‘Stop Playing With My Mind‘. This was the first Nelson surprise of the weekend for me. I’d never realised that it was him doing vocals on that last song! As I was doing a bit of digging around on the Ultratop site, I stumbled upon ‘My Destiny‘. I assumed it was another old track, but as it turns out it’s a brand new single! 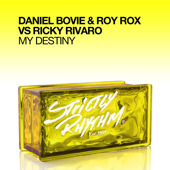 Once again it’s produced by Daniel Bovie & Roy Rox, but this time with the help of Ricky Rivaro. Now here’s where it gets confusing. Nelson had mentioned after this week’s tv performance that he’s working an album for early next year and that a new single was coming up soon. Would that be ‘My Destiny’ then? One would assume so, but then why doesn’t Nelson get a mention on the single sleeve? In fact, the credits for Nelson’s entire discography since signing with Mostiko are all over the place! It’s an OCD iTunes tagger’s ultimate nightmare! And that’s not even including the two tracks he did for ‘Registrated 2’. ‘Imagination‘ and ‘Now You’re Gone‘ are credited as Regi & Nelson and I can definitely see them popping up on the album. Be it the original versions or, as was the case with Katerine’s ‘Back Off‘, in remixed form. I guess only time will tell, so as for now let’s just enjoy this rather enjoyable new single and the fact that Nelson’s recording an album. No matter what songs will or will not be included and how they might have to be tagged! The Alex Natale remix of Gloria Gaynor’s ‘First Be A Woman‘, still a major win on all fronts.